Memory management involves maintaining optimal sizes for the Oracle Database instance memory structures as demands on the database change. The memory structures that must be managed are the system global area (SGA) and the instance program global area (instance PGA). Oracle Database supports various memory management methods, which are chosen by initialization parameter settings. Oracle recommends that you enable the method known as automatic memory management. Oracle Database can manage the SGA memory and instance PGA memory completely automatically. You designate only the total memory size to be used by the instance, and Oracle Database dynamically exchanges memory between the SGA and the instance PGA as needed to meet processing demands. This capability is referred to as automatic memory management. With this memory management method, the database also dynamically tunes the sizes of the individual SGA components and the sizes of the individual PGAs. These memory management methods are described later in this chapter. If you create your database with Database Configuration Assistant (DBCA) and choose the basic installation option, automatic memory management is enabled when system memory is less than or equal to 4 gigabytes. When system memory is greater than 4 gigabytes, automatic memory management is disabled, and automatic shared memory management is enabled. If you choose advanced installation, then DBCA enables you to select automatic memory management or automatic shared memory management. The easiest way to manage memory is to use the graphical user interface of Oracle Enterprise Manager Database Express (EM Express) or Oracle Enterprise Manager Cloud Control (Cloud Control). For information about managing memory with EM Express, see Oracle Database 2 Day DBA. For information about managing memory with Cloud Control, see the Cloud Control online help. Oracle Database Concepts for an introduction to the various automatic and manual methods of managing memory. Understand basic memory structures associated with Oracle Database. Figure 6-1 illustrates the relationships among these memory structures. Description of "Figure 6-1 Oracle Database Memory Structures"
If your database is running on Solaris or Oracle Linux, you can optionally add another memory component: Database Smart Flash Cache. 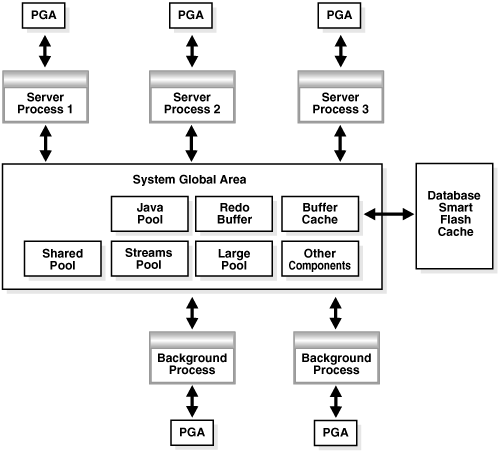 Database Smart Flash Cache is an extension of the SGA-resident buffer cache, providing a level 2 cache for database blocks. It can improve response time and overall throughput for both read-intensive online transaction processing (OLTP) workloads and ad hoc queries and bulk data modifications in a data warehouse environment. Database Smart Flash Cache resides on one or more flash disk devices, which are solid state storage devices that use flash memory. Database Smart Flash Cache is typically more economical than additional main memory, and is an order of magnitude faster than disk drives. In single-instance and Oracle Real Application Clusters (Oracle RAC) databases, parallel queries can use the big table cache when the DB_BIG_TABLE_CACHE_PERCENT_TARGET initialization parameter is set to a non-zero value, and PARALLEL_DEGREE_POLICY is set to AUTO or ADAPTIVE. In a single-instance configuration only, serial queries can use the big table cache when the DB_BIG_TABLE_CACHE_PERCENT_TARGET initialization parameter is set to a non-zero value. "Configuring Database Smart Flash Cache"
You can allow the Oracle Database instance to automatically manage and tune memory for you. The simplest way to manage instance memory is to allow the Oracle Database instance to automatically manage and tune it for you. To do so (on most platforms), you set only a target memory size initialization parameter (MEMORY_TARGET) and optionally a maximum memory size initialization parameter (MEMORY_MAX_TARGET). The total memory that the instance uses remains relatively constant, based on the value of MEMORY_TARGET, and the instance automatically distributes memory between the system global area (SGA) and the instance program global area (instance PGA). As memory requirements change, the instance dynamically redistributes memory between the SGA and instance PGA. When automatic memory management is not enabled, you must size both the SGA and instance PGA manually. Because the MEMORY_TARGET initialization parameter is dynamic, you can change MEMORY_TARGET at any time without restarting the database. MEMORY_MAX_TARGET, which is not dynamic, serves as an upper limit so that you cannot accidentally set MEMORY_TARGET too high, and so that enough memory is set aside for the database instance in case you do want to increase total instance memory in the future. Because certain SGA components either cannot easily shrink or must remain at a minimum size, the instance also prevents you from setting MEMORY_TARGET too low. You cannot enable automatic memory management if the LOCK_SGA initialization parameter is TRUE. See Oracle Database Reference for information about this parameter. "Platforms That Support Automatic Memory Management"
If you did not enable automatic memory management upon database creation (either by selecting the proper options in DBCA or by setting the appropriate initialization parameters for the CREATE DATABASE SQL statement), then you can enable it at a later time. Enabling automatic memory management involves a shutdown and restart of the database. Start SQL*Plus and connect to the Oracle Database instance with the SYSDBA administrative privilege. See "Connecting to the Database with SQL*Plus" and "Database Administrator Authentication" for instructions. See "Enabling Automatic Shared Memory Management" for information about setting the SGA_TARGET parameter if it is not set. Compute the maximum value between the query result from step 2b and PGA_AGGREGATE_TARGET. Add SGA_TARGET to this value. For example, if SGA_TARGET is 272M and PGA_AGGREGATE_TARGET is 90M as shown above, and if the maximum PGA allocated is determined to be 120M, then MEMORY_TARGET should be at least 392M (272M + 120M). Choose the value for MEMORY_TARGET that you want to use. This can be the minimum value that you computed in step 2, or you can choose to use a larger value if you have enough physical memory available. For the MEMORY_MAX_TARGET initialization parameter, decide on a maximum amount of memory that you would want to allocate to the database for the foreseeable future. That is, determine the maximum value for the sum of the SGA and instance PGA sizes. This number can be larger than or the same as the MEMORY_TARGET value that you chose in the previous step. where n is the value that you computed in Step 4. The SCOPE = SPFILE clause sets the value only in the server parameter file, and not for the running instance. You must include this SCOPE clause because MEMORY_MAX_TARGET is not a dynamic initialization parameter. where n is the value that you determined in Step 4, and m is the value that you determined in step 3. In a text initialization parameter file, if you omit the line for MEMORY_MAX_TARGET and include a value for MEMORY_TARGET, then the database automatically sets MEMORY_MAX_TARGET to the value of MEMORY_TARGET. If you omit the line for MEMORY_TARGET and include a value for MEMORY_MAX_TARGET, then the MEMORY_TARGET parameter defaults to zero. After startup, you can then dynamically change MEMORY_TARGET to a nonzero value, provided that it does not exceed the value of MEMORY_MAX_TARGET. Shut down and restart the database. See Starting Up and Shutting Down for instructions. where n is the value that you determined in step 3. With MEMORY_TARGET set, the SGA_TARGET setting becomes the minimum size of the SGA and the PGA_AGGREGATE_TARGET setting becomes the minimum size of the instance PGA. By setting both of these to zero as shown, there are no minimums, and the SGA and instance PGA can grow as needed as long as their sum is less than or equal to the MEMORY_TARGET setting. The sizing of SQL work areas remains automatic. You can omit the statements that set the SGA_TARGET and PGA_AGGREGATE_TARGET parameter values to zero and leave either or both of the values as positive numbers. In this case, the values act as minimum values for the sizes of the SGA or instance PGA. In addition, you can use the PGA_AGGREGATE_LIMIT initialization parameter to set an instance-wide hard limit for PGA memory. You can set PGA_AGGREGATE_LIMIT whether or not you use automatic memory management. See "Using Automatic PGA Memory Management". The dynamic performance view V$MEMORY_DYNAMIC_COMPONENTS shows the current sizes of all dynamically tuned memory components, including the total sizes of the SGA and instance PGA. Query the V$MEMORY_TARGET_ADVICE view for tuning advice for the MEMORY_TARGET initialization parameter. The row with the MEMORY_SIZE_FACTOR of 1 shows the current size of memory, as set by the MEMORY_TARGET initialization parameter, and the amount of DB time required to complete the current workload. In previous and subsequent rows, the results show several alternative MEMORY_TARGET sizes. For each alternative size, the database shows the size factor (the multiple of the current size), and the estimated DB time to complete the current workload if the MEMORY_TARGET parameter were changed to the alternative size. Notice that for a total memory size smaller than the current MEMORY_TARGET size, estimated DB time increases. Notice also that in this example, there is nothing to be gained by increasing total memory size beyond 450MB. However, this situation might change if a complete workload has not yet been run. EM Express provides an easy-to-use graphical memory advisor to help you select an optimal size for MEMORY_TARGET. See Oracle Database 2 Day DBA for details. Oracle Database Performance Tuning Guide for a definition of DB time. If you prefer to exercise more direct control over the sizes of individual memory components, you can disable automatic memory management and configure the database for manual memory management. There are two different manual memory management methods for the SGA, and two for the instance PGA. The two manual memory management methods for the SGA vary in the amount of effort and knowledge required by the DBA. With automatic shared memory management, you set target and maximum sizes for the SGA. The database then sets the total size of the SGA to your designated target, and dynamically tunes the sizes of many SGA components. With manual shared memory management, you set the sizes of several individual SGA components, thereby determining the overall SGA size. You then manually tune these individual SGA components on an ongoing basis. For the instance PGA, there is automatic PGA memory management, in which you set a target size for the instance PGA. The database then sets the size of the instance PGA to your target, and dynamically tunes the sizes of individual PGAs. There is also manual PGA memory management, in which you set maximum work area size for each type of SQL operator (such as sort or hash-join). This memory management method, although supported, is not recommended. Oracle Database Concepts for an overview of Oracle Database memory management methods. Automatic Shared Memory Management simplifies SGA memory management. With automatic shared memory management, you specify the total amount of SGA memory available to an instance using the SGA_TARGET initialization parameter and Oracle Database automatically distributes this memory among the various SGA components to ensure the most effective memory utilization. When automatic shared memory management is enabled, the sizes of the different SGA components are flexible and can adapt to the needs of a workload without requiring any additional configuration. The database automatically distributes the available memory among the various components as required, allowing the system to maximize the use of all available SGA memory. If you are using a server parameter file (SPFILE), the database remembers the sizes of the automatically tuned SGA components across instance shutdowns. As a result, the database instance does not need to learn the characteristics of the workload again each time the instance is started. The instance can begin with information from the previous instance and continue evaluating workload where it left off at the last shutdown. The SGA comprises several memory components, which are pools of memory used to satisfy a particular class of memory allocation requests. Examples of memory components include the shared pool (used to allocate memory for SQL and PL/SQL execution), the java pool (used for java objects and other java execution memory), and the buffer cache (used for caching disk blocks). All SGA components allocate and deallocate space in units of granules. Oracle Database tracks SGA memory use in internal numbers of granules for each SGA component. The memory for dynamic components in the SGA is allocated in the unit of granules. The granule size is determined by the amount of SGA memory requested when the instance starts. Specifically, the granule size is based on the value of the SGA_MAX_SIZE initialization parameter. Table 6-1 shows the granule size for different amounts of SGA memory. Some platform dependencies may arise. Consult your operating system specific documentation for more details. You can query the V$SGAINFO view to see the granule size that is being used by an instance. The same granule size is used for all components in the SGA. If you specify a size for a component that is not a multiple of granule size, Oracle Database rounds the specified size up to the nearest multiple. For example, if the granule size is 4 MB and you specify DB_CACHE_SIZE as 10 MB, the database actually allocates 12 MB. The SGA_MAX_SIZE initialization parameter specifies the maximum size of the System Global Area for the lifetime of the instance. Set the SGA_MAX_SIZE initialization parameter. You can dynamically alter the initialization parameters affecting the size of the buffer caches, shared pool, large pool, Java pool, and streams pool but only to the extent that the sum of these sizes and the sizes of the other components of the SGA (fixed SGA, variable SGA, and redo log buffers) does not exceed the value specified by SGA_MAX_SIZE. If you do not specify SGA_MAX_SIZE, then Oracle Database selects a default value that is the sum of all components specified or defaulted at initialization time. If you do specify SGA_MAX_SIZE, and at the time the database is initialized the value is less than the sum of the memory allocated for all components, either explicitly in the parameter file or by default, then the database ignores the setting for SGA_MAX_SIZE and chooses a correct value for this parameter. You enable the automatic shared memory management feature by setting the SGA_TARGET initialization parameter to a nonzero value. This parameter sets the total size of the SGA. It replaces the parameters that control the memory allocated for a specific set of individual components, which are now automatically and dynamically resized (tuned) as needed. Set the SGA_TARGET initialization parameter to a nonzero value. The STATISTICS_LEVEL initialization parameter must be set to TYPICAL (the default) or ALL for automatic shared memory management to function. An easier way to enable automatic shared memory management is to use EM Express. When you enable automatic shared memory management and set the Total SGA Size, EM Express automatically generates the ALTER SYSTEM statements to set SGA_TARGET to the specified size and to set all automatically sized SGA components to zero. See Oracle Database 2 Day DBA for more information. If you use SQL*Plus to set SGA_TARGET, then you must then set the automatically sized SGA components to zero or to a minimum value. Some SGA components are automatically sized when SGA_TARGET is set. The following table lists the SGA components that are automatically sized when SGA_TARGET is set. For each SGA component, its corresponding initialization parameter is listed. The manually sized parameters listed in Table 6-3, if they are set, take their memory from SGA_TARGET, leaving what is available for the components listed in Table 6-2. In addition to setting SGA_TARGET to a nonzero value, you must set to zero all initialization parameters listed in Table 6-2 to enable full automatic tuning of the automatically sized SGA components. Alternatively, you can set one or more of the automatically sized SGA components to a nonzero value, which is then used as the minimum setting for that component during SGA tuning. This is discussed in detail later in this section. For optimal performance in most systems, the entire SGA should fit in real memory. If it does not, and if virtual memory is used to store parts of it, then overall database system performance can decrease dramatically. The reason for this is that portions of the SGA are paged (written to and read from disk) by the operating system. See your operating system documentation for instructions for monitoring paging activity. You can also view paging activity using Cloud Control. See Oracle Database 2 Day + Performance Tuning Guide for more information. The V$SGAINFO view provides information on the current tuned sizes of various SGA components. The V$SGA_TARGET_ADVICE view provides information that helps you decide on a value for SGA_TARGET. Query the V$SGAINFO and V$SGA_TARGET_ADVICE views. The information in this view is similar to that provided in the V$MEMORY_TARGET_ADVICE view for automatic memory management. See "Monitoring and Tuning Automatic Memory Management" for an explanation of that view. EM Express provides an easy-to-use graphical memory advisor to help you select an optimal size for SGA_TARGET. See Oracle Database 2 Day DBA for details. The procedure for enabling automatic shared memory management (ASMM) differs depending on whether you are changing to ASMM from manual shared memory management or from automatic memory management. where value is the value computed in step 1 or is some value between the sum of all SGA component sizes and SGA_MAX_SIZE. For more information on the ALTER SYSTEM statement and its SCOPE clause, see Oracle Database SQL Language Reference. For more complete automatic tuning, set the values of the automatically sized SGA components listed in Table 6-2 to zero. Do this by editing the text initialization parameter file or by issuing ALTER SYSTEM statements. To control the minimum size of one or more automatically sized SGA components, set those component sizes to the desired value. (See the next section for details.) Set the values of the other automatically sized SGA components to zero. Do this by editing the text initialization parameter file or by issuing ALTER SYSTEM statements. Set the MEMORY_TARGET initialization parameter to 0. The database sets SGA_TARGET based on current SGA memory allocation. For more complete automatic tuning, set the sizes of the automatically sized SGA components listed in Table 6-2 to zero. Do this by editing the text initialization parameter file or by issuing ALTER SYSTEM statements. To control the minimum size of one or more automatically sized SGA components, set those component sizes to the desired value. (See the next section for details.) Set the sizes of the other automatically sized SGA components to zero. Do this by editing the text initialization parameter file or by issuing ALTER SYSTEM statements. where 992M = 1200M minus 208M. You can exercise some control over the size of the automatically sized SGA components by specifying minimum values for the parameters corresponding to these components. Doing so can be useful if you know that an application cannot function properly without a minimum amount of memory in specific components. Set a value for its corresponding initialization parameter. Manually limiting the minimum size of one or more automatically sized components reduces the total amount of memory available for dynamic adjustment. This reduction in turn limits the ability of the system to adapt to workload changes. Therefore, this practice is not recommended except in exceptional cases. The default automatic management behavior maximizes both system performance and the use of available resources. The SGA_TARGET parameter can be dynamically increased up to the value specified for the SGA_MAX_SIZE parameter, and it can also be reduced. If you reduce the value of SGA_TARGET, the system identifies one or more automatically tuned components for which to release memory. You can reduce SGA_TARGET until one or more automatically tuned components reach their minimum size. Oracle Database determines the minimum allowable value for SGA_TARGET taking into account several factors, including values set for the automatically sized components, manually sized components that use SGA_TARGET space, and number of CPUs. The change in the amount of physical memory consumed when SGA_TARGET is modified depends on the operating system. On some UNIX platforms that do not support dynamic shared memory, the physical memory in use by the SGA is equal to the value of the SGA_MAX_SIZE parameter. On such platforms, there is no real benefit in setting SGA_TARGET to a value smaller than SGA_MAX_SIZE. Therefore, setting SGA_MAX_SIZE on those platforms is not recommended. On other platforms, such as Solaris and Windows, the physical memory consumed by the SGA is equal to the value of SGA_TARGET. When enabling automatic shared memory management, it is best to set SGA_TARGET to the desired nonzero value before starting the database. Dynamically modifying SGA_TARGET from zero to a nonzero value may not achieve the desired results because the shared pool may not be able to shrink. After startup, you can dynamically tune SGA_TARGET up or down as required. When automatic shared memory management is enabled, the manually specified sizes of automatically sized components serve as a lower bound for the size of the components. You can modify this limit dynamically by changing the values of the corresponding parameters. If the specified lower limit for the size of a given SGA component is less than its current size, then there is no immediate change in the size of that component. The new setting only limits the automatic tuning algorithm to that reduced minimum size in the future. Set the initialization parameter for the component to the minimum. In this example, if you increase the value of LARGE_POOL_SIZE to a value greater than the actual current size of the component, the system expands the component to accommodate the increased minimum size. For example, if you increase the value of LARGE_POOL_SIZE to 300M, then the system increases the large pool incrementally until it reaches 300M. This resizing occurs at the expense of one or more automatically tuned components. If you decrease the value of LARGE_POOL_SIZE to 200, there is no immediate change in the size of that component. The new setting only limits the reduction of the large pool size to 200 M in the future. When SGA_TARGET is not set, the automatic shared memory management feature is not enabled. Therefore, the rules governing the resizing of all component parameters are the same as in earlier releases. Parameters for manually sized components can be dynamically altered as well. However, rather than setting a minimum size, the value of the parameter specifies the precise size of the corresponding component. When you increase the size of a manually sized component, extra memory is taken away from one or more automatically sized components. When you decrease the size of a manually sized component, the memory that is released is given to the automatically sized components. Set the initialization parameter for the component. In this example, increasing DB_8K_CACHE_SIZE by 16M to 144M means that the 16M is taken away from the automatically sized components. Likewise, reducing DB_8K_CACHE_SIZE by 16M to 112M means that the 16M is given to the automatically sized components. To manage shared memory manually, you first ensure that both automatic memory management and automatic shared memory management are disabled. You then manually configure, monitor, and tune memory components.. If you decide not to use automatic memory management or automatic shared memory management, you must manually configure several SGA component sizes, and then monitor and tune these sizes on an ongoing basis as the database workload changes. You can follow guidelines on setting the parameters that control the sizes of these SGA components. Provide values for the initialization parameters that set SGA component sizes. Omit SGA component size parameters from the text initialization file. Oracle Database chooses reasonable defaults for any component whose size you do not set. There is no initialization parameter that in itself enables manual shared memory management. You effectively enable manual shared memory management by disabling both automatic memory management and automatic shared memory management. Set the SGA_TARGET initialization parameter to 0. You must then set values for the various SGA components, as described in the following sections. The buffer cache initialization parameters determine the size of the buffer cache component of the SGA. You use them to specify the sizes of caches for the various block sizes used by the database. These initialization parameters are all dynamic. The size of a buffer cache affects performance. Larger cache sizes generally reduce the number of disk reads and writes. However, a large cache may take up too much memory and induce memory paging or swapping. Oracle Database supports multiple block sizes in a database. If you create tablespaces with non-standard block sizes, you must configure non-standard block size buffers to accommodate these tablespaces. The standard block size is used for the SYSTEM tablespace. You specify the standard block size by setting the initialization parameter DB_BLOCK_SIZE. Legitimate values are from 2K to 32K. If you intend to use multiple block sizes in your database, you must have the DB_CACHE_SIZE and at least one DB_nK_CACHE_SIZE parameter set. Oracle Database assigns an appropriate default value to the DB_CACHE_SIZE parameter, but the DB_nK_CACHE_SIZE parameters default to 0, and no additional block size caches are configured. Each parameter specifies the size of the cache for the corresponding block size. Platform-specific restrictions regarding the maximum block size apply, so some of these sizes might not be allowed on some platforms. A 32K block size is valid only on 64-bit platforms. "Specifying Nonstandard Block Sizes for Tablespaces"
An example illustrates setting block and cache sizes. In the preceding example, the parameter DB_BLOCK_SIZE sets the standard block size of the database to 4K. The size of the cache of standard block size buffers is 1024MB. Additionally, 2K and 8K caches are also configured, with sizes of 256MB and 512MB, respectively. The DB_nK_CACHE_SIZE parameters cannot be used to size the cache for the standard block size. If the value of DB_BLOCK_SIZE is nK, it is invalid to set DB_nK_CACHE_SIZE. The size of the cache for the standard block size is always determined from the value of DB_CACHE_SIZE. The cache has a limited size, so not all the data on disk can fit in the cache. When the cache is full, subsequent cache misses cause Oracle Database to write dirty data already in the cache to disk to make room for the new data. (If a buffer is not dirty, it does not need to be written to disk before a new block can be read into the buffer.) Subsequent access to any data that was written to disk and then overwritten results in additional cache misses. The size of the cache affects the likelihood that a request for data results in a cache hit. If the cache is large, it is more likely to contain the data that is requested. Increasing the size of a cache increases the percentage of data requests that result in cache hits. You can change the size of the buffer cache while the instance is running, without having to shut down the database. Do this with the ALTER SYSTEM statement. Use the fixed view V$BUFFER_POOL to track the sizes of the different cache components and any pending resize operations. You can configure the database buffer cache with separate buffer pools that either keep data in the buffer cache or make the buffers available for new data immediately after using the data blocks. Particular schema objects (tables, clusters, indexes, and partitions) can then be assigned to the appropriate buffer pool to control the way their data blocks age out of the cache. The KEEP buffer pool retains the schema object's data blocks in memory. The RECYCLE buffer pool eliminates data blocks from memory as soon as they are no longer needed. The DEFAULT buffer pool contains data blocks from schema objects that are not assigned to any buffer pool, as well as schema objects that are explicitly assigned to the DEFAULT pool. The initialization parameters that configure the KEEP and RECYCLE buffer pools are DB_KEEP_CACHE_SIZE and DB_RECYCLE_CACHE_SIZE. Multiple buffer pools are only available for the standard block size. Non-standard block size caches have a single DEFAULT pool. The SHARED_POOL_SIZE initialization parameter is a dynamic parameter that lets you specify or adjust the size of the shared pool component of the SGA. Oracle Database selects an appropriate default value. In releases before Oracle Database 10g, the amount of shared pool memory that was allocated was equal to the value of the SHARED_POOL_SIZE initialization parameter plus the amount of internal SGA overhead computed during instance startup. The internal SGA overhead refers to memory that is allocated by Oracle Database during startup, based on the values of several other initialization parameters. This memory is used to maintain state for different server components in the SGA. For example, if the SHARED_POOL_SIZE parameter is set to 64MB and the internal SGA overhead is computed to be 12MB, the real size of the shared pool is 64+12=76MB, although the value of the SHARED_POOL_SIZE parameter is still displayed as 64MB. Starting with Oracle Database 10g, the size of the internal SGA overhead is included in the user-specified value of SHARED_POOL_SIZE. If you are not using automatic memory management or automatic shared memory management, the amount of shared pool memory that is allocated at startup is equal to the value of the SHARED_POOL_SIZE initialization parameter, rounded up to a multiple of the granule size. You must therefore set this parameter so that it includes the internal SGA overhead in addition to the desired value for shared pool size. In the previous example, if the SHARED_POOL_SIZE parameter is set to 64MB at startup, then the available shared pool after startup is 64-12=52MB, assuming the value of internal SGA overhead remains unchanged. In order to maintain an effective value of 64MB for shared pool memory after startup, you must set the SHARED_POOL_SIZE parameter to 64+12=76MB. When migrating from a release that is earlier than Oracle Database 10g, the Oracle Database 12c migration utilities recommend a new value for this parameter based on the value of internal SGA overhead in the pre-upgrade environment and based on the old value of this parameter. Beginning with Oracle Database 10g, the exact value of internal SGA overhead, also known as startup overhead in the shared pool, can be queried from the V$SGAINFO view. Also, in manual shared memory management mode, if the user-specified value of SHARED_POOL_SIZE is too small to accommodate even the requirements of internal SGA overhead, then Oracle Database generates an ORA-00371 error during startup, with a suggested value to use for the SHARED_POOL_SIZE parameter. When you use automatic shared memory management in Oracle Database 12c, the shared pool is automatically tuned, and an ORA-00371 error would not be generated. The result cache takes its memory from the shared pool. Therefore, if you expect to increase the maximum size of the result cache, take this into consideration when sizing the shared pool. "Specifying the Result Cache Maximum Size"
The LARGE_POOL_SIZE initialization parameter is a dynamic parameter that lets you specify or adjust the size of the large pool component of the SGA. The large pool is an optional component of the SGA. You must specifically set the LARGE_POOL_SIZE parameter to create a large pool. Configuring the large pool is discussed in Oracle Database Performance Tuning Guide. The JAVA_POOL_SIZE initialization parameter is a dynamic parameter that lets you specify or adjust the size of the Java pool component of the SGA. Oracle Database selects an appropriate default value. Configuration of the Java pool is discussed in Oracle Database Java Developer's Guide. The STREAMS_POOL_SIZE initialization parameter is a dynamic parameter that lets you specify or adjust the size of the Streams Pool component of the SGA. If STREAMS_POOL_SIZE is set to 0, then the Oracle Streams product transfers memory from the buffer cache to the Streams Pool when it is needed. For details, see the discussion of the Streams Pool in Oracle Streams Replication Administrator's Guide. The RESULT_CACHE_MAX_SIZE initialization parameter is a dynamic parameter that enables you to specify the maximum size of the result cache component of the SGA. Typically, there is no need to specify this parameter, because the default maximum size is chosen by the database based on total memory available to the SGA and on the memory management method currently in use. You can view the current default maximum size by displaying the value of the RESULT_CACHE_MAX_SIZE parameter. To change this maximum size, you can set RESULT_CACHE_MAX_SIZE with an ALTER SYSTEM statement, or you can specify this parameter in the text initialization parameter file. In each case, the value is rounded up to the nearest multiple of 32K. If RESULT_CACHE_MAX_SIZE is 0 upon instance startup, the result cache is disabled. To reenable it you must set RESULT_CACHE_MAX_SIZE to a nonzero value (or remove this parameter from the text initialization parameter file to get the default maximum size) and then restart the database. The result cache takes its memory from the shared pool, so if you increase the maximum result cache size, consider also increasing the shared pool size. The view V$RESULT_CACHE_STATISTICS and the PL/SQL package procedure DBMS_RESULT_CACHE.MEMORY_REPORT display information to help you determine the amount of memory currently allocated to the result cache. The PL/SQL package function DBMS_RESULT_CACHE.FLUSH clears the result cache and releases all the memory back to the shared pool. Oracle Database PL/SQL Packages and Types Reference for more information about the DBMS_RESULT_CACHE package procedures and functions. Oracle Database Reference for more information about the V$RESULT_CACHE_STATISTICS view. Oracle Real Application Clusters Administration and Deployment Guide for information on setting RESULT_CACHE_MAX_SIZE for a cluster database. You can set a few additional initialization parameters to control how the SGA uses memory. The LOCK_SGA parameter, when set to TRUE, locks the entire SGA into physical memory. This parameter cannot be used with automatic memory management. The SHARED_MEMORY_ADDRESS and HI_SHARED_MEMORY_ADDRESS parameters specify the SGA's starting address at run time. These parameters are rarely used. For 64-bit platforms, HI_SHARED_MEMORY_ADDRESS specifies the high order 32 bits of the 64-bit address. "Using Automatic Shared Memory Management"
The USE_INDIRECT_DATA_BUFFERS parameter enables the use of the extended buffer cache mechanism for 32-bit platforms that can support more than 4 GB of physical memory. On platforms that do not support this much physical memory, this parameter is ignored. This parameter cannot be used with automatic memory management or automatic shared memory management. By default, Oracle Database automatically and globally manages the total amount of memory dedicated to the instance PGA. You can control this amount by setting the initialization parameter PGA_AGGREGATE_TARGET. Oracle Database then tries to ensure that the total amount of PGA memory allocated across all database server processes and background processes never exceeds this target. If you create your database with DBCA, you can specify a value for the total instance PGA. DBCA then sets the PGA_AGGREGATE_TARGET initialization parameters in the server parameter file (SPFILE) that it creates. If you do not specify the total instance PGA, DBCA chooses a reasonable default. If you create the database with the CREATE DATABASE SQL statement and a text initialization parameter file, you can provide a value for PGA_AGGREGATE_TARGET. If you omit this parameter, the database chooses a default value for it. With automatic PGA memory management, sizing of SQL work areas is automatic and all *_AREA_SIZE initialization parameters are ignored. At any given time, the total amount of PGA memory available to active work areas on the instance is automatically derived from the parameter PGA_AGGREGATE_TARGET. This amount is set to the value of PGA_AGGREGATE_TARGET minus the PGA memory allocated for other purposes (for example, session memory). The resulting PGA memory is then allotted to individual active work areas based on their specific memory requirements. There are dynamic performance views that provide PGA memory use statistics. Most of these statistics are enabled when PGA_AGGREGATE_TARGET is set. The PGA_AGGREGATE_TARGET setting is a target. Therefore, Oracle Database tries to limit PGA memory usage to the target, but usage can exceed the setting at times. To specify a hard limit on PGA memory usage, use the PGA_AGGREGATE_LIMIT initialization parameter. Oracle Database ensures that the PGA size does not exceed this limit. If the database exceeds the limit, then the database aborts calls from sessions that have the highest untunable PGA memory allocations. You can set PGA_AGGREGATE_LIMIT whether or not you use automatic memory management. If PGA_AGGREGATE_LIMIT is not set, then Oracle Database determines an appropriate default limit. See Oracle Database Reference for more information about this parameter. The automatic PGA memory management method applies to work areas allocated by both dedicated and shared server process. See Oracle Database Concepts for information about PGA memory allocation in dedicated and shared server modes. Oracle Database supports manual PGA memory management, in which you manually tune SQL work areas. In releases earlier than Oracle Database 10g, the database administrator controlled the maximum size of SQL work areas by setting the following parameters: SORT_AREA_SIZE, HASH_AREA_SIZE, BITMAP_MERGE_AREA_SIZE and CREATE_BITMAP_AREA_SIZE. Setting these parameters is difficult, because the maximum work area size is ideally selected from the data input size and the total number of work areas active in the system. These two factors vary greatly from one work area to another and from one time to another. Thus, the various *_AREA_SIZE parameters are difficult to tune under the best of circumstances. For this reason, Oracle strongly recommends that you leave automatic PGA memory management enabled. If you decide to tune SQL work areas manually, you must set the WORKAREA_SIZE_POLICY initialization parameter to MANUAL. The initialization parameter WORKAREA_SIZE_POLICY is a session- and system-level parameter that can take only two values: MANUAL or AUTO. The default is AUTO. You can set PGA_AGGREGATE_TARGET, and then switch back and forth from auto to manual memory management mode. When WORKAREA_SIZE_POLICY is set to AUTO, your settings for *_AREA_SIZE parameters are ignored. An Oracle Database instance can cache the full database in the buffer cache. In default caching mode, Oracle Database does not always cache the underlying data when a user queries a large table because doing so might remove more useful data from the buffer cache. Starting with Oracle Database 12c Release 1 (12.1.0.2), if the Oracle Database instance determines that there is enough space to cache the full database in the buffer cache and that it would be beneficial to do so, then the instance automatically caches the full database in the buffer cache. Caching the full database in the buffer cache might result in performance improvements. You can force an instance to cache the database in the buffer cache using an ALTER DATABASE FORCE FULL DATABASE CACHING statement. This statement puts the instance in force full database caching mode. In this mode, Oracle Database assumes that the buffer cache is large enough to cache the full database and tries to cache all blocks that are accessed subsequently. When an instance is in default caching mode, NOCACHE LOBs are not cached in the buffer cache. However, when an instance is in force full database caching mode, NOCACHE LOBs can be cached in the buffer cache. Also, both LOBs that use SecureFiles LOB storage and LOBs that use BasicFiles LOB storage can be cached in the buffer cache in force full database caching mode only. When an instance is put in force full database caching mode, database objects are not loaded into the buffer cache immediately. Instead, they are cached in the buffer cache when they are accessed. In a multitenant environment, force full database caching mode applies to the entire multitenant container database (CDB), including all of its pluggable databases (PDBs). Information about force full database caching mode is stored in the control file. If the control file is replaced or recreated, then the information about the force full database caching mode is lost. A restored control file might or might not include this information, depending on when the control file was backed up. The database must be at 12.0.0 or higher compatibility level to enable force full database caching mode for the database instance. In addition, ensure that the buffer cache is large enough to cache the entire database. This query returns the buffer cache size for all possible block sizes. If your database uses multiple block sizes, then it is best to ensure that the buffer cache size for each possible block size is bigger than the total database size for that block size. If you plan to use SGA_TARGET, then you can estimate the buffer cache size as 60% of SGA_TARGET. If you plan to use MEMORY_TARGET, then you can estimate the SGA size as 60% of MEMORY_TARGET, and buffer cache size as 60% of SGA size. That is, you can estimate the buffer cache size as 36% of MEMORY_TARGET. You can enable force full database caching mode for a database. Connect to the instance as a user with ALTER DATABASE system privilege. Ensure that the database is mounted but not open. See "Starting an Instance and Mounting a Database". You can disable force full database caching mode for a database. The Database Smart Flash Cache feature is a transparent extension of the database buffer cache using solid state device (SSD) technology. Database Smart Flash Cache can greatly improve the performance of Oracle databases by reducing the amount of disk I/O at a much lower cost than adding an equivalent amount of RAM. You should consider configuring Database Smart Flash Cache when certain conditions are met. Your database is running on the Solaris or Oracle Linux operating systems. Database Smart Flash Cache is supported on these operating systems only. The Buffer Pool Advisory section of your Automatic Workload Repository (AWR) report or STATSPACK report indicates that doubling the size of the buffer cache would be beneficial. db file sequential read is a top wait event. You cannot share one flash file among multiple instances. However, you can share a single flash device among multiple instances if you use a logical volume manager or similar tool to statically partition the flash device. As a general rule, size Database Smart Flash Cache to be between 2 times and 10 times the size of the buffer cache. Any multiplier less than two would not provide any benefit. If you are using automatic shared memory management, make Database Smart Flash Cache between 2 times and 10 times the size of SGA_TARGET. Using 80% of the size of SGA_TARGET instead of the full size would also suffice for this calculation. For each database block moved from the buffer cache to Database Smart Flash Cache, a small amount of metadata about the block is kept in the buffer cache. For a single instance database, the metadata consumes approximately 100 bytes. For an Oracle Real Application Clusters (Oracle RAC) database, it is closer to 200 bytes. You must therefore take this extra memory requirement into account when adding Database Smart Flash Cache. If you are managing memory manually, then increase the size of the buffer cache by an amount approximately equal to the number of database blocks that fit into the Database Smart Flash Cache as configured, multiplied by 100 (or 200 for Oracle RAC). If you are using automatic memory management, then increase the size of MEMORY_TARGET using the algorithm described above. You may first have to increase the size of MEMORY_MAX_TARGET. If you are using automatic shared memory management, then increase the size of SGA_TARGET. Also, for an Oracle RAC database that uses the flash cache, additional memory must be allocated to the shared pool for Global Cache Service (GCS) resources. Each GCS resource requires approximately 208 bytes in the shared pool. You can choose to not increase the buffer cache size to account for Database Smart Flash Cache. In this case, the effective size of the buffer cache is reduced. In some cases, you can offset this loss by using a larger Database Smart Flash Cache. You can use a set of initialization parameters to configure Database Smart Flash Cache. Specifies a list of paths and file names for the files to contain Database Smart Flash Cache, in either the operating system file system or an Oracle Automatic Storage Management disk group. If a specified file does not exist, then the database creates it during startup. Each file must reside on a flash device. If you configure Database Smart Flash Cache on a disk drive (spindle), then performance may suffer. A maximum of 16 files is supported. Specifies the size of each file in your Database Smart Flash Cache. Each size corresponds with a file specified in DB_FLASH_CACHE_FILE. The files and sizes correspond in the order that they are specified. An error is raised if the number of specified sizes does not match the number of specified files. Each size specification must be less than or equal to the physical memory size of its flash device. The size is expressed as nG, indicating the number of gigabytes (GB). For example, to specify a 16 GB Database Smart Flash Cache, set DB_FLASH_CACHE_SIZE value to 16G. You can query the V$FLASHFILESTAT view to determine the cumulative latency and read counts of each file and compute the average latency. You can use ALTER SYSTEM to set DB_FLASH_CACHE_SIZE to zero for each flash device you wish to disable. You can also use ALTER SYSTEM to set the size for any disabled flash device back to its original size to reenable it. However, dynamically changing the size of Database Smart Flash Cache is not supported. Oracle recommends that you configure a Database Smart Flash Cache on either all or none of the instances in an Oracle Real Application Clusters environment. Also, the total flash cache size configured on each instance should be approximately the same. The In-Memory Column Store (IM column store) is an optional portion of the system global area (SGA) that stores copies of tables, table partitions, and other database objects. In the IM column store, data is populated by column rather than row as it is in other parts of the SGA, and data is optimized for rapid scans. The IM column store is included with the Oracle Database In-Memory option. You can choose from various compression methods and data population options for the IM column store. The IM column store is a new static pool in the SGA. Data in the IM column store does not reside in the traditional row format but instead in a columnar format. Each column is stored as a separate structure. The IM column store does not replace the buffer cache, but acts as a supplement, so that data can be stored in memory in both row and columnar formats. To enable the IM column store, the INMEMORY_SIZE initialization parameter must be set to a non-zero value. If it is enabled at the tablespace level, then all tables and materialized views in the tablespace are enabled for the IM column store by default. You can populate all of a database object's columns in the IM column store or a subset of the database object's columns. Similarly, for a partitioned table or materialized view, you can populate all of the partitions in the IM column store or a subset of the partitions. Typically, multi-column indexes are created to improve the performance of analytic and reporting queries. These indexes can impede the performance of data manipulation language (DML) statements. When a database object is populated in the IM column store, indexes used for analytic or reporting queries can be reduced or eliminated without affecting query performance. Eliminating these indexes can improve the performance of transactions and data loading operations. A database object that is enabled for the IM column store might not be populated in it. Therefore, such a database object might not appear in the results for this query. However, you can increase the priority level to increase the likelihood that the database object is populated the IM column store. See "IM Column Store Data Population Options". Other views, such as the DBA_TABLES view, show candidates for the IM column store. Also, a database object cannot be populated in the IM column store if it is owned by the SYS user and it is stored in the SYSTEM or SYSAUX tablespace. "Initialization Parameters Related to the IM Column Store"
In the IM column store, data can be compressed, and SQL queries execute directly on compressed data. Table 6-5 summarizes the data compression methods supported in the IM column store. The data is not compressed. This method optimizes the data for DML operations and compresses IM column store data the least (excluding NO MEMCOMPRESS). This method results in the best query performance. This method compresses IM column store data more than MEMCOMPRESS FOR DML but less than MEMCOMPRESS FOR QUERY HIGH. This method is the default when the INMEMORY clause is specified without a compression method in a CREATE or ALTER SQL statement or when MEMCOMPRESS FOR QUERY is specified without including either LOW or HIGH. This method results in excellent query performance. This method compresses IM column store data more than MEMCOMPRESS FOR QUERY LOW but less than MEMCOMPRESS FOR CAPACITY LOW. This method results in good query performance. This method compresses IM column store data more than MEMCOMPRESS FOR QUERY HIGH but less than MEMCOMPRESS FOR CAPACITY HIGH. This method is the default when MEMCOMPRESS FOR CAPACITY is specified without including either LOW or HIGH. This method results in fair query performance. This method compresses IM column store data the most. In a SQL statement, the MEMCOMPRESS keyword must be preceded by the INMEMORY keyword. When you enable a database object for the IM column store, you can either let Oracle Database control when the database object's data is populated in the IM column store (default), or you can specify a priority level that determines the priority of the database object in the population queue. Oracle SQL includes an INMEMORY PRIORITY subclause that provides more control over the queue for population. For example, it might be more important or less important to populate a database object's data before populating the data for other database objects. Table 6-6 describes the supported priority levels. Oracle Database controls when the database object's data is populated in the IM column store. A scan of the database object triggers the population of the object into the IM column store. This is the default level when PRIORITY is not included in the INMEMORY clause. The database object's data is populated in the IM column store before database objects with the following priority level: NONE. The database object's data is populated in the IM column store after database objects with the following priority levels: MEDIUM, HIGH, or CRITICAL. The database object's data is populated in the IM column store before database objects with the following priority levels: NONE or LOW. The database object's data is populated in the IM column store after database objects with the following priority levels: HIGH or CRITICAL. The database object's data is populated in the IM column store before database objects with the following priority levels: NONE, LOW, or MEDIUM. The database object's data is populated in the IM column store after database objects with the following priority level: CRITICAL. The database object's data is populated in the IM column store before database objects with the following priority levels: NONE, LOW, MEDIUM, or HIGH. When more than one database object has a priority level other than NONE, Oracle Database queues all of the data for the database objects to be populated in the IM column store based on priority level. Data for database objects with the CRITICAL priority level are populated first, data for database objects with the HIGH priority level are populated next, and so on. If there is no space remaining in the IM column store, then no additional objects are populated in it until sufficient space becomes available. When a database is restarted, all of the data for database objects with a priority level other than NONE are populated in the IM column store during startup. For a database object with a priority level other than NONE, an ALTER TABLE or ALTER MATERIALIZED VIEW DDL statement involving the database object does not return until the DDL changes are recorded in the IM column store. The priority level setting must apply to an entire table or to a table partition. Specifying different IM column store priority levels for different subsets of columns in a table is not allowed. If a segment on disk is 64 KB or less, then it is not populated in the IM column store. Therefore, some small database objects that were enabled for the IM column store might not be populated in it. A set of initialization parameters are related to the IM column store. This initialization parameter sets the size of the IM column store in a database instance. The default value is 0, which means that the IM column store is not used. This initialization parameter must be set to a non-zero value to enable the IM column store. If the parameter is set to a non-zero value, then the minimum setting is 100M. In a multitenant environment, the setting for this parameter in the root is the setting for the entire multitenant container database (CDB). This parameter can also be set in each pluggable database (PDB) to limit the maximum size of the IM column store for each PDB. The sum of the PDB values can be less than, equal to, or greater than the CDB value. However, the CDB value is the maximum amount of memory available in the IM column store for the entire CDB, including the root and all of the PDBs. Unless this parameter is specifically set for a PDB, the PDB inherits the CDB value, which means that the PDB can use all of the available IM column store for the CDB. This initialization parameter can enable tables and materialized views for the IM column store or disable all tables and materialized views for the IM column store. Set this parameter to DEFAULT, the default value, to allow the INMEMORY or NO INMEMORY attributes on the individual database objects determine if they will be populated in the IM column store. Set this parameter to OFF to specify that all tables and materialized views are disabled for the IM column store. This initialization parameter enables you to specify a default IM column store clause for new tables and materialized views. Leave this parameter unset or set it to an empty string to specify that there is no default IM column store clause for new tables and materialized views. Setting the value of this parameter to NO INMEMORY has the same effect as setting it to the default value (the empty string). Set this parameter to a valid INMEMORY clause to specify that the clause is the default for all new tables and materialized views. The clause can include valid clauses for IM column store compression methods and data population options. If the clause starts with INMEMORY, then all new tables and materialized views, including those without an INMEMORY clause, are populated in the IM column store. If the clause omits INMEMORY, then it only applies to new tables and materialized views that are enabled for the IM column store with an INMEMORY clause during creation. This initialization parameter specifies whether in-memory queries are allowed. Set this parameter to ENABLE, the default value, to allow queries to access database objects populated in the IM column store, or set this parameter to DISABLE to disable access to the database objects populated in the IM column store. This initialization parameter specifies the maximum number of background populate servers to use for IM column store population, so that these servers do not overload the rest of the system. Set this parameter to an appropriate value based on the number of cores in the system. When INMEMORY_MAX_POPULATE_SERVERS is set to 0, objects cannot be populated in the IM column store. This initialization parameter limits the maximum number of background populate servers used for IM column store repopulation, as trickle repopulation is designed to use only a small percentage of the populate servers. The value for this parameter is a percentage of the INMEMORY_MAX_POPULATE_SERVERS initialization parameter value. For example, if this parameter is set to 10 and INMEMORY_MAX_POPULATE_SERVERS is set to 10, then on average one core is used for trickle repopulation. This initialization parameter enables or disables all of the optimizer cost model enhancements for in-memory. Setting the parameter to FALSE causes the optimizer to ignore the in-memory property of tables during the optimization of SQL statements. "Managing Initialization Parameters Using a Server Parameter File"
Before tables, tablespaces, or materialized views can be enabled for the IM column store, you must enable the IM column store for the database. Ensure that the database is at 12.1.0 or higher compatibility level. Set the INMEMORY_SIZE initialization parameter to a non-zero value. When you set this parameter in a server parameter file (SPFILE) using the ALTER SYSTEM statement, you must specify SCOPE=SPFILE. The minimum setting is 100M. You must restart the database to initialize the IM column store in the SGA. You enable a table for the IM column store by including an INMEMORY clause in a CREATE TABLE or ALTER TABLE statement. You disable a table for the IM column store by including a NO INMEMORY clause in a CREATE TABLE or ALTER TABLE statement. Ensure that the IM column store is enabled for the database. See "Enabling the IM Column Store for a Database". Connect to the database instance as a user with the appropriate privileges to either create the table or alter the table. Run a CREATE TABLE or ALTER TABLE statement with an INMEMORY clause or a NO INMEMORY clause. Examples illustrate how to enable or disable tables for the IM column store. View and run a related example on Oracle Live SQL at Oracle Live SQL: Enabling and Disabling Tables for the In-Memory Column Store. This example uses the defaults for the INMEMORY clause. Therefore, MEMCOMPRESS FOR QUERY is used, and PRIORITY NONE is used. This example uses the default for the PRIORITY clause. Therefore, PRIORITY NONE is used. This example uses the default for the MEMCOMPRESS clause. Therefore, MEMCOMPRESS FOR QUERY is used. This example enables some columns in the oe.product_information table for the IM column store but not others. It also specifies different IM column store compression methods for the columns enabled for the IM column store. The list of columns starting with product_id and ending with min_price are enabled for the IM column store with the MEMCOMPRESS FOR QUERY compression method. The list of columns starting with product_description and ending with list_price are enabled for the IM column store with the MEMCOMPRESS FOR CAPACITY HIGH compression method. The weight_class and catalog_url columns are not enabled for the IM column store. You can query the V$IM_COLUMN_LEVEL view to determine the selective column compression levels that are defined for a database object. You can query the V$IM_SEGMENTS view to list the database objects that are populated in the IM column store. See "Overview of the IM Column Store" for a sample query. You can enable or disable tablespaces for the IM column store. You can enable a tablespace for the IM column store during tablespace creation with a CREATE TABLESPACE statement that includes the INMEMORY clause. You can also alter a tablespace to enable it for the IM column store with an ALTER TABLESPACE statement that includes the INMEMORY clause. You disable a tablespace for the IM column store by including a NO INMEMORY clause in a CREATE TABLESPACE or ALTER TABLESPACE statement. When a tablespace is enabled for the IM column store, all tables and materialized views in the tablespace are enabled for the IM column store by default. The INMEMORY clause is the same for tables, materialized views, and tablespaces. The DEFAULT storage clause is required before the INMEMORY clause when enabling a tablespace for the IM column store and before the NO INMEMORY clause when disabling a tablespace for the IM column store. When a tablespace is enabled for the IM column store, individual tables and materialized views in the tablespace can have different in-memory settings, and the settings for individual database objects override the settings for the tablespace. For example, if the tablespace is set to PRIORITY LOW for populating data in memory, but a table in the tablespace is set to PRIORITY HIGH, then the table uses PRIORITY HIGH. Connect to the database instance as a user with the appropriate privileges to either create the tablespace or alter the tablespace. Run a CREATE TABLESPACE or ALTER TABLESPACE statement with an INMEMORY clause or a NO INMEMORY clause. You can enable and disable materialized views for the IM coumn store. You enable a materialized view for the IM column store by including an INMEMORY clause in a CREATE MATERIALIZED VIEW or ALTER MATERIALIZED VIEW statement. You disable a materialized view for the IM column store by including a NO INMEMORY clause in a CREATE MATERIALIZED VIEW or ALTER MATERIALIZED VIEW statement. Connect to the database instance as a user with the appropriate privileges to either create the materialized view or alter the materialized view. Run a CREATE MATERIALIZED VIEW or ALTER MATERIALIZED VIEW statement with an INMEMORY clause or a NO INMEMORY clause. With this option, Data Pump keeps the IM column store clause for all objects that have one. When the TRANSFORM=INMEMORY:n option is specified, Data Pump drops the IM column store clause from all objects that have one. You can also use the TRANSFORM=INMEMORY_CLAUSE:string option to override the IM column store clause for a database object in the dump file during import. For example, you can use this option to change the IM column store compression for a database object being imported. You can configure and manage the IM column store in Enterprise Manager Cloud Control. Before you can enable a database to use the IM column store, you must ensure that the database is at a Release 12.1.0.2 or higher compatibility level. In other words, the value for the initialization parameter COMPATIBLE should be set to 12.1.0.0. From the Database Home page in Enterprise Manager, navigate to the Initialization Parameters page by choosing Initialization Parameters from the Administration menu. You can use this page to set or change the compatibility level. Search for the parameter COMPATIBLE. The category for the parameter is Miscellaneous. Change the value to 12.1.0.0 and click Apply. You will be prompted to restart the database. After the database is restarted, the new value that you set takes effect. Search for the parameter INMEMORY_SIZE. The category for the parameter is In-Memory. Change the value and click Apply. You can set the value to any value above the minimum size of 100M. You will then be prompted to restart the database. You can use the In-Memory Column Store Central Home page to monitor in-memory support for database objects such as tables, indexes, partitions and tablespaces. You can view in-memory functionality for objects and monitor their In-Memory usage statistics. The In-Memory Object Access Heatmap displays the top 100 objects in the In-Memory Store with their relative sizes and shows you how frequently objects are accessed, represented by different colors. To activate the heat map, you must turn on the option for the heatmap in the init.ora parameter file. Generally there is a one day wait period before the map is activated. You can use the date selector to pick the date range for objects displayed in the Heat Map. You can also use the slider to control the granularity of the color. Use the Configuration section to view the status settings such as In-Memory Query, In-Memory Force, and Default In-Memory Clause. Click Edit to navigate to the Initialization Parameters page where you can change the values and settings displayed in this section. Use the Performance section to view the metrics for Active Sessions. Use the Objects Summary section to view the Compression Factor and data about the memory used by the populated objects. The In-Memory Enabled Object Statistics are available in a pop-up window through a drill-down from the View In-Memory Enabled Object Statistics link on the page. Use the In-Memory Objects Distribution section to view the distribution on a percentage basis of the various objects used in memory. The section includes a chart showing the distribution of Partitions, Sub-partitions, Non-partitioned Tables, and Non-partitioned Materialized Views. The numerical values for each are displayed above the chart. Use the In-Memory Objects Search section to search for objects designated for In-Memory use. Click Search after you enter the parameters by which you want to search. The results table shows the Name of each object found along with its Size, Size in Memory, Size on Disk, In-Memory percentage, and its In-Memory parameters. You can also search for accessed objects that are either in-memory or not in-memory. If the heatmap is enabled, the Accessed Objects option appears in the drop-down list in the View field of the In-Memory Objects Search box. When you select Accessed Objects, you can filter based on the top 100 objects with access data that are either in-memory or not in-memory. You can select a time range and search for objects within that range. If you select the All Objects In-Memory option, you can view the list of top 100 objects that are in-memory based on their in-memory size. If you are working in a RAC environment, you can quickly move between instances by selecting the instance in the Instances selection box above and on the right side of the heatmap. You can specify IM column store details when creating a table or partition. From the Schema menu, choose Database Objects, then select the Tables option. Click Create to create a table. The Create Table page is shown. Select the In-Memory Column Store tab to specify the in-memory options for the table. Choose to override the column level in-memory details (if required) in the table below where the columns are specified. Optionally, you can click on the Partitions tab. Create table partitions as needed using the wizard. To specify IM column store details for a partition, select it from the table in the Partitions tab, and then click Advanced Options. After entering all necessary IM column store details at the table level, column level, and partitions level, click Show SQL to see the generated SQL. Click OK to create the table. You can view or edit IM column store details of a table. Search for the desired table and click View to view its details. Click Edit to launch the Edit Table page. Alternatively, you can also click Edit on the Search page. Use the In-Memory Column Store tab to specify in-memory options for the table. Edit the required details and click Apply. You can view or edit IM column store details of a partition. Search for the table that contains the desired partition, select it, then click View. Alternatively, you can also click Edit on the Table Search page. Click the Partitions tab, select the desired partition, and click Advanced Options. Edit the required details, and click OK to go back to the Partitions tab. After making similar changes to all desired partitions of the table, click Apply. You can specify IM column store details when creating a tablespace. From the Administration menu, choose Storage, and then select the Tablespaces option. Click Create to create a tablespace. Enter the details that appear on the General tab. Click the In-Memory Column Store tab. After entering all required IM column store details for the tablespace, click Show SQL. Click Return from the Show SQL page and then in the resulting page click OK.
Click OK to create the tablespace. The IM column store settings of a tablespace apply for any new table created in the tablespace. IM column store configuration details must be specified at the individual table level if a table must override the configuration of the tablespace. You can view or edit IM column store details of a tablespace. From the Administration menu, choose Storage, then select the Tablespaces option. Search for the desired tablespace, select it, then click View. Click Edit to launch the Edit Tablespace page, then click the In-Memory Column Store tab. You can specify IM column store details when creating a materialized view. From the Schema menu, choose Materialized Views, then select the Materialized Views option. Click Create to create a materialized view. Enter the materialized view name, and specify its query. Click the In-Memory Column Store tab to specify IM column store options for the materialized view. After entering all necessary IM column store details, click Show SQL. Click Return from the Show SQL page, and then in the resulting page click OK.
Click OK to create the materialized view. You can view or edit IM column store details of a materialized view. Search for the desired materialized view, and click View to view its details. Click Edit to launch the Edit Materialized View page. Edit the required details, and click Apply. Automatic memory management is supported only on some platforms. Also, you can query a set of data dictionary views for information on memory management. Some platforms support automatic memory management. A set of dynamic performance views provide information on memory management. Displays summary information about the system global area (SGA). Displays size information about the SGA, including the sizes of different SGA components, the granule size, and free memory. Displays detailed information about how memory is allocated within the shared pool, large pool, Java pool, and Streams pool. Displays PGA memory usage statistics as well as statistics about the automatic PGA memory manager when it is enabled (that is, when PGA_AGGREGATE_TARGET is set). Cumulative values in V$PGASTAT are accumulated since instance startup. Displays information on the current size of all automatically tuned and static memory components, with the last operation (for example, grow or shrink) that occurred on each. Displays the current sizes of all SGA components, and the last operation for each component. Displays information about resize operations that are currently in progress. A resize operation is an enlargement or reduction of the SGA, the instance PGA, or a dynamic SGA component. Displays information about dynamic SGA component resize operations that are currently in progress. Displays information about the last 800 completed memory component resize operations, including automatic grow and shrink operations for SGA_TARGET and PGA_AGGREGATE_TARGET. Displays information about the last 800 completed SGA component resize operations. Displays information that helps you tune MEMORY_TARGET if you enabled automatic memory management. Displays information that helps you tune SGA_TARGET. Displays information that helps you tune PGA_AGGREGATE_TARGET. Displays information about the storage allocated for all segments in the IM column store. Note: This view is available starting with Oracle Database 12c Release 1 (12.1.0.2).